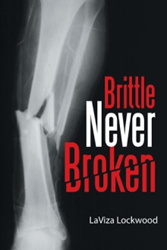 LaViza Lockwood returns to the literary limelight with the release of “Brittle Never Broken” (published by AuthorHouse), a poignant memoir proving how a child with a disability can be happy despite the pain. Hers is a story of healing and change, family and love, against life’s hurdles. The book is about a baby who grows into a young woman with a disability, who endures broken bones, physical and verbal abuse, poverty, racism and fear. Raised in a dysfunctional family and surrounded by those who turn to alcohol and drugs for relief, Lockwood could have easily been caught up in this way of living. However, as she gets older and is introduced to God, she realizes it is possible to live a life free from misery and poverty. She sets out to make it happen and succeeds. “People who live in Chicago will feel a connection. Even those who lived in the southern states during the ‘60s and migrated to Chicago, and can relate to farming, will get a sense of nostalgia. Likewise, those who are less fortunate, have lived, or are currently living in public housing will be able to relate to my book. People with physical and mental disabilities who have spent time in the hospital or attended schools for people with disabilities, will feel they are not alone,” Lockwood says. AuthorHouse, an Author Solutions, Inc. self-publishing imprint, is a leading provider of book publishing, marketing, and bookselling services for authors around the globe and offers the industry’s only suite of Hollywood book-to-film services. Committed to providing the highest level of customer service, AuthorHouse assigns each author personal publishing and marketing consultants who provide guidance throughout the process. Headquartered in Bloomington, Indiana, AuthorHouse celebrated 15 years of service to authors in Sept. 2011. For more information or to publish a book visit authorhouse.com or call 1-888-519-5121. For the latest, follow @authorhouse on Twitter.